When it comes to cleaning engineered hardwood floors, you have to make sure you follow a specific procedure so that you get the best results without potentially damaging your floor. Lucky for you, the following information is going to tell you exactly how to clean engineered hardwood floors. By the end of this tutorial, you will have no problem cleaning your floors in a way that is satisfactory for you and helps to ensure you get the best results with little to no damage to the floor you are cleaning. Of course, if you want to get the best results when it comes to this particular tutorial, you’ll find that you should have all of the products at your access so that you can use what you need when you need it. The following things are some of the things that would be most helpful to have on hand. If you can, try and have a vacuum, a damp mop and access to water. While you may need some more things along the way, those are the three main things you will need. The reason and uses for each of the products will be described below so you can have a firm understanding of how to use them to clean the floors you have in your home. When it comes to cleaning your floor, you essentially have two choices to choose from and the first is using a vacuum. While this is probably going to be the easiest option for you to choose from, you need to make sure your vacuum has a couple features or else you will be in a lot of trouble. You should make sure that your vacuum has the option to turn the rotating bristle bar off in the front or else it will run across the floor and it runs the risk of scratching it. Additionally, if your vacuum has a hardwood floor option, you can set it to that and you will be fine. If neither of those option are possible for you, then you can set your vacuum to the highest possible setting so that it is furthest away from the crown and should reduce the chance of scratching. If you want to find one of the best ways to clean your floor, then you want to go with a damp mop because it is able to accomplish everything you need with little to no risk of any damage occurring to the hardwood floors. If you have the choice, go with a microfiber mop head because it is not abrasive. 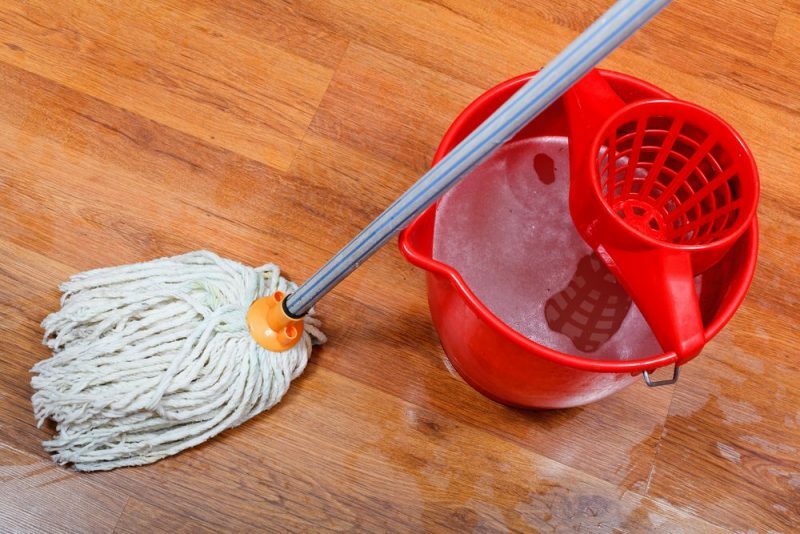 Be sure to not soak the mop with too much water because even though it can withstand humidity a lot better than actual hardwood floors, any water buildup can damage the floor and leave you with a warped and damaged floor to deal with. While the vacuum and the damp mop are two of the best choices when it comes to cleaning your engineered hardwood floors, there are some thing you want to remember when it comes to cleaning because there are some products you will not want to use and some practices you will want to avoid. If you insist on using some sort of a cleaner, you need to make sure you avoid ammonia or other harsh detergents because instead of cleaning the floor, they will lead to more damage. Furthermore, NEVER use a steam cleaner on the floor because all it is going to do is force moisture down into the wood and cause damage at the time or even further down the line. Additionally, this was briefly touched upon above, but you should never use anything that is abrasive and could scratch the floor. This means you should avoid using steel wool or scouring pads to clean up the floor. If you are unsure of what you should do with your floor or you think yours might be a bit different, you can follow the instruction you got from the manufacturer when you bought the floor. I’m sure you’ve already realized it by now, but there is quite a bit to remember when it comes to cleaning engineered hardwood floors and it’s important you keep all of this information in line when you go to clean! Not only are you going to help ensure that you get the best cleaning results possible, but it can extend the life of your floor as a whole. Instead of doing it all by yourself, you can also hire the professionals in your home town such as the cleaning services in Chicago. I hope you have enjoyed everything I discussed in this post and please feel free to share with your friends and family! Additionally, drop a comment below with any additional advice or comments you have on the topic!